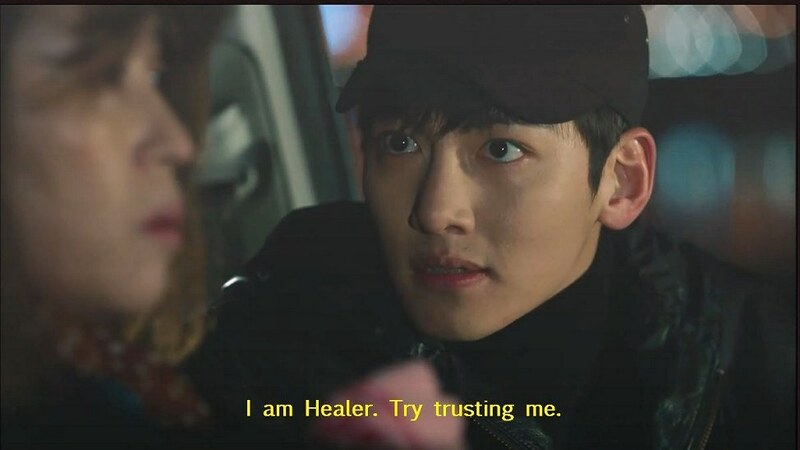 I kept hearing rave reviews about this Korean drama called Healer as I watched other shows - no one seemed to dislike it at all - it's closing in on 4000 reviews for it on Dramafever, one of the highest numbers I've ever seen for any show on the web site. Written by Song Ji Na, a highly respected drama writer who brought Korea great shows like Sandglass and Faith, I knew it had potential to be a real crowd pleaser but even I didn't know at first just how beloved it would turn out to be, making a star out of its good looking leading man, actor Ji Chang Wook. I purposely waited till all episodes were concluded before I started it -- and then I fell asleep on the first episode four times! Whatever magic it was supposed to have I guess I just didn't see it in episode one! I gave up for a few weeks, scratching my head over why everyone loved it so much. Then I decided I should give it another chance so I tried again and forced my eyes to stay open for that first episode again -- I think because in that first episode our hero (who really wasn't a hero in the classic sense), a delivery courier code-named "Healer" was almost like a robot or bionic man, running here, running there, and I really didn't feel any immediate empathy for him. He only worked for money, he said, to save for his eventual goal of buying an island paradise and retiring there, spending the rest of his life totally away from human beings. He didn't seem real to me at all. The first episode had chases galore; car chases, rooftop chases, street chases, stairway building chases, elevator chases, and I was a bit overwhelmed. When he stated that he was determined never to feel close to his fellow human beings, or to get emotionally involved with any of his clients, and that he didn't care if the letters and packages and messages he was delivering to people were coming from criminal sources or not, that also didn't win me over to his raison d'être. Once I got through the first episode, however, I found the show starting to get more interesting, and by the eighth episode, when they had a great falling elevator scene worthy of Hitchcock, and our hero (who was finally becoming more of a hero in that classic sense) finally showed some human emotions for the girl he had rescued, was I able to say out loud, "Hey, this is pretty good!" To be sure it will probably never be at the top of my long K-drama list of shows watched but it was pleasant and fun, the actors were solid and worked perfectly as an ensemble team, the writing got better as the series progressed, and there was a very nice and surprising happy ending that I thought satisfying. The music was a bit repetitious but then it is in a lot of Korean dramas so I couldn't fault it too much for that. I should add that this show had a LOT of flashback scenes because all the main characters were somehow connected earlier in their lives, but none of them knew that at first -- another common plot device of Korean television dramas. If you're not fully awake while watching this show it can be easy to get confused at first about who's who and who came from which family, because there are so many characters. Just go with the flow, however: you'll figure it all out eventually. 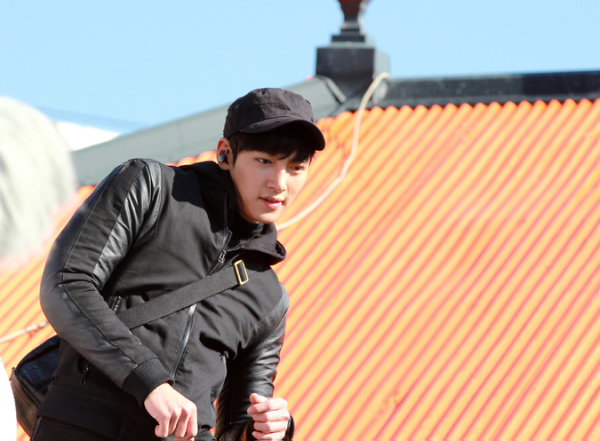 Our man Healer (proper name Seo Jung Hoo, played by Ji Chang Wook) works as a special courier, often servicing nefarious characters from the underground, so he keeps his real identity secret as a matter of self-protection, often wearing disguises to shield his face as much as possible from other people. He works with a computer hacker Ahjumma (older lady) named Min Ja Jo (veteran actress Mi Kyung Kim from Master's Sun) with whom he stays in touch almost constantly by ear mic. Their private exchanges over communication devices are often the highlights of every dramatic scene; they allow the audience to know or to suspect what their next moves will be. They are obviously fond of each other, and Ahjumma loves to tease him. They do not meet in person until near the very end of the show, to keep up the suspense for the audience of their clandestine working relationship. Eventually Healer is hired by a star reporter and TV anchor named Kim Moon Ho (Ji Tae Yu from K-drama Star's Lover, the films Ditto, Oldboy, and Midnight FM) to check out a young woman named Young-shin Chae (Min Young Park from City Hunter) who is a low level internet reporter whom he suspects might have a family connection to him and others he loves, including his brother, a rich businessman named Moon-sik Kim (Sang-won Park from Sandglass) and his invalid sister-in-law in a wheelchair Myung-hee Choi, who had lost a young daughter years before under mysterious circumstances (the lovely actress Ji Won Do played this role so sincerely; she was herself kidnapped in real life in 1998 at a sports stadium and held for ransom). Moon Ho wants a DNA sample from Young-shin, to see if she is his sister-in-law's long lost daughter, and it's up to Healer to get it. However Young-shin is too smart for him and senses he is trailing her. Ahjumma tells him to grab her purse because a comb or brush in the purse would supply them with the needed DNA through hair samples; Healer causes a diversion on the street, grabs her purse, but she tracks him down and a fight occurs in a restroom, with Healer taking nail clippers, holding her tightly from the back so she can't see his face, and getting his DNA samples through her nail clippings. Young-shin seems to be the last person on earth at first who would soften the Healer's heart but her cute and brave personality begins to cause him to get emotionally involved with her as he is ordered to keep a close watch on her after an attempt on her life. After Young-shin starts to work for a company Moon Ho sets up called Someday News she becomes more famous as a reporter, exposing people like corrupt politicians, causing Healer to pretend to be someone else, a fledgling reporter named Bong-soo Park, hired at the station as a newbie, but really to keep a watchful eye over her. As this alternate identity working with her every day, Healer feels more free to give her subtle hints that he's fond of her, but she tells him she is waiting for "someone", touches her heart, and basically tells him she is off limits to him and that he shouldn't get hurt. Young-shin has a sort of girl crush on the older Moon Ho, not realizing the family connection between them. She had always wanted to discover who her birth parents were after being lost to them as a little girl. After being abused and beaten as a child she had been taken in and raised by a loving adoptive father named Chae Chi-soo (Park Sang-myun), who runs a coffee shop and has raised her with good values. Moon Ho keeps her birth information secret from her for everyone's protection. Moon Ho, ace reporter that he is, soon realizes the real enemy all of them face, a rich Mafia-type of guy code-named Elder (Choi Jong-won) and that all their lives are at risk because of this criminally insane creep who seems to control so many lives, including Moon Ho's brother-in-law Moon-sik, through blackmail. After having to save Healer as "Bong-soo", Young-shin starts to figure things out, little by little.  When Healer loses someone close to him, he doesn't know how to deal with it and turns to Young-shin for comfort; eventually their relationship does turn romantic, and hidden truths are revealed. By the end, Young-shin, Moon Ho, Healer and Ahjumma, team up together to expose Elder and all his cohorts in a very dramatic, exciting fashion. I loved the airport scene near the end - that scene and the falling elevator scene in episode eight were my two favorite scenes in the show. 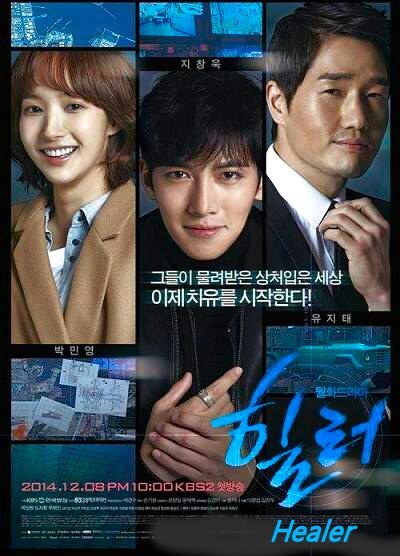 The show Healer is a cool thriller and crime story with many layers to it that was extremely popular on Dramafever (for some reason Koreans weren't as fond of it, only giving it average ratings of 7% throughout its run in Korea - I think Americans simply have different tastes and prefer action shows). The cast all have great chemistry together and it's definitely worth your time to catch this ultra-popular Korean drama. 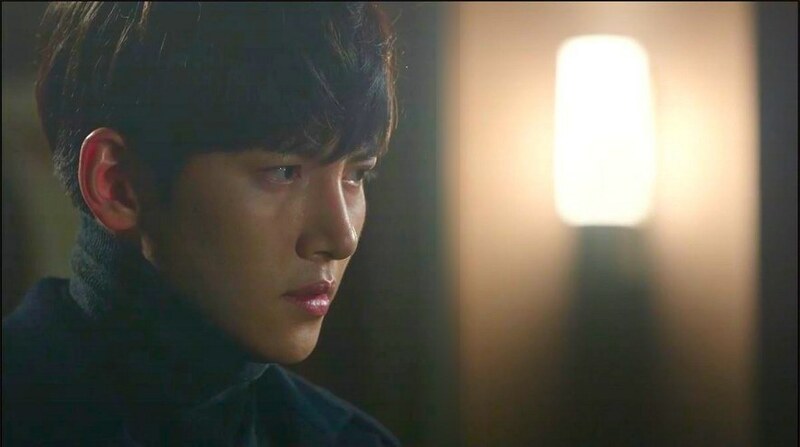 I'm not sure that actor Ji Chang Wook will ever reach the star status of a Lee Min Ho, but he's certainly on his way with the role of Healer.